What an exciting race we're in store for tomorrow! That run to turn one could be tasty! What was the long run pace like on Friday? Is there anyone in the top 10 locked in from Q2 on Hypersoft tires? Looks like RBR, Merc, and Ferrari all used Ultrasofts. I think 7-10 all used hypers, so I'm expecting a Singapore repeat and Force India blowing past them in the first stint. I think its a question of who will make contact at the first turns. The way the grid lines up we could go nearly 4 wide into the first corner or at least 3 of them wide. How angry is Max that he missed pole? That could be a factor in how aggressive he is on the first lap. Max, agressive on the first lap??? Are you sure?? Well we know how Verstappen's going to approach it so it'll be up to Ricciardo to really get his elbows out if they're next to each other into turn 1 if he wants any chance to win. If Verstappen leads after the 1st corner, I reckon game over. If memory serves me correctly Mexico was an absolute stinker last year with very little overtaking. Whoever leads out of T1 has a very good chance at bringing it home. If, like last year, they lead out of turn one while their rivals smash each other off in the background, then yeah. Otherwise, we'll find out. There was never a proper race for the lead last year. Don't be fooled by the shy reserved demeanour, I think at least once previously this has been known to happen. Hamilton would do well to be cautious into turn 1. Vettel has to be the last of the late breakers because he has to win. Verstappen doesn't like sharing the track and Ricciardo has P1. Best case scenario he inherits the lead and a Mercedes 1-2 (which he can give to Bottas for giving him the win in Russia), worst case scenario he's P4 and still in the hunt for the win or podium. However, if he's aggressive and DNFs himself and the RBs, its the biggest own goal all season even bigger than Vettels crash in Germany. Since Hamilton is champion by mathematical certainty if he finishes anywhere in the top six - no matter what Vettel does - he'd be silly to take any risks at all. If I were him, I wouldn't even fight Vettel if he tried to overtake me. Finishing is all he needs. True, hamilton also has to worry about the constructors championship as well so a DNF wont go down well at mercedes. With how fast they've been down the main straight it wouldn't surprise me at all to see Vettel come out of T1 in 1st. Unless he completely blindsides Verstappen, they will both end up crashing into T1 methinks especially if there is any overlap whatsoever between the cars. If Red Bull are still in a 1-2 position after turn one then Raikkonen and Bottas may well have extended first stints on those tyres to try and impede them. Ferrari will have been gutted that Bottas was able to go to an old engine and avoid penalties. With him still floating around the top 6, trying an aggressive undercut with Vettel would leave him vulnerable to a tyre sapping and time haemorrhaging battle with the Finn. I think he will continue to calculate risk and execute. His attempted pass on Max at Austin gave Max a lot of room and minimized the chance of a collision. On the whole, Lewis is a pretty clean racer. He gets in fewer collisions than Max or Seb and the ones he does get into, he comes away with less damage to his car and his race strategy. Already planning the turn 1 shunt there Seb????? Lewis will obviously be trying to avoid a Collision on the first lap but as per the race last year, it can be possible to be shunted from behind whilst minding your own business. Eh? He says the Red Bull's might blow up and that he has good straight line speed so may be able to make up positions into t1, where in there does he indicate he's planning a shunt? Seb's statement about "we’ll see what we can do into Turn One and then go from there." to me means that he will do a typical over the top Sebastian passing attempt. Would not mind being proved wrong. Won't be surprised if we see some sort of reprise of last year's turn one debacle though. Sounds to me Vettel knows he has the best car for starts, straight line speed plus drag and then we see what happens from there. He knows the race will be won at turn 1. Red bull won't be playing any team game and both there drivers know it's about turn 1, could get very messy. With Ricciardo' s luck the last 2 drivers you want around you is an angry Verstappen and Vettel. My crappy DVR didn't register that. Vettel has a terrible record here and the last thing he wants is another incident. But everything will depend on the starts. Hamilton can benefit too if RBR do something stupid. I think with Vettel he will be aggressive. All drivers are saying tyres will be the key for this race. One stint on hypersoft for 5 laps then two 33-lap stints on supersoft. One stint on ultrasoft for 15-18 laps, then supersoft to the flag. So basically the Ultras will be nursed to lap 18-20 then. Yeah, to make a two stopper work you have to be able to pass competitors when you have the better tires. That doesn't work so well these days with difficult passing and at a track like Mexico that is not conducive to passing. 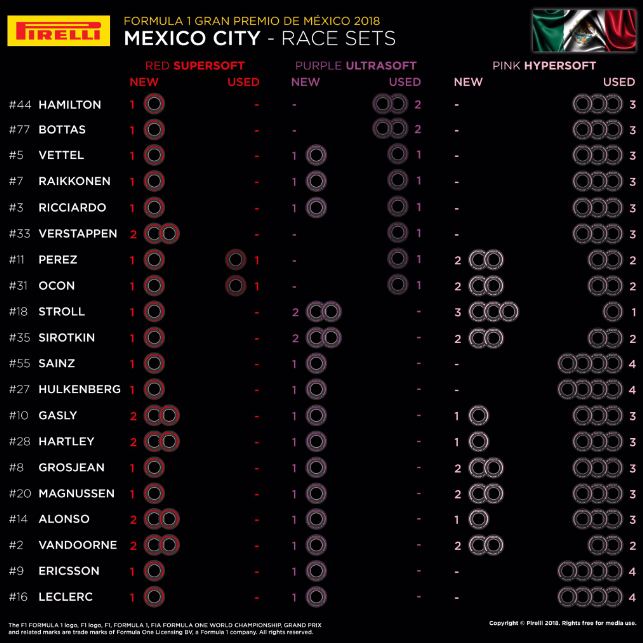 Looking at the reserved tires, both Mercedes and Ferrari only have one set of SuperSofts for each driver if they want a third set of tires for any driver they will have to go back to a used set of Ultras or used Hypers. I am guessing that since Merc and Ferrari have more speed on the straights, they will have some advantage in the race with DRS enabled. Don't knnow that Red Bull will be able to translate better cornering to an advantage, especially when they are not in the lead. Strategy for the red and silver teams: Park on the tail of the Red Bull through the stadium section and then use your top speed through the DRS zone and pass before turn 1. Last edited by Mort Canard on Sun Oct 28, 2018 6:18 pm, edited 1 time in total. Nah, Mercedes will one stop and let anyone who wants to two stop pass them on the track. 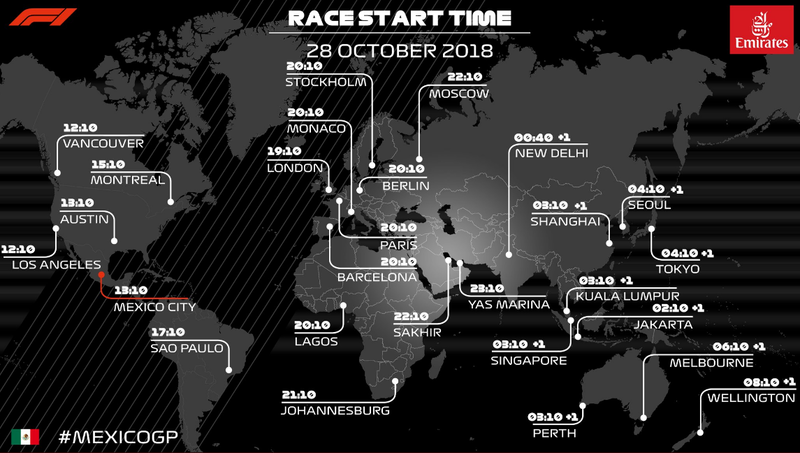 I believe yesterday I saw in f1 website that the race will start in 10mins from now, but today suddenly postponed to another 1hour? Why?